This review is going to be quick and fun, because that’s how I viewed this book. Full of some really interesting new ideas, it was a quick read that I enjoyed immensely. At first, I was slightly horrified by the ways of Claysoot. This is a town with moderate living conditions, but they are far from perfect. They’re surrounded on all sides by a big wall that cannot be crossed. Everyone who crosses it ends up in Claysoot the next day dead, completely burned to a crisp beyond recognition. The water doesn’t run properly, the housing isn’t at its finest, the way to get food was by hunting with bows and arrows. Oh, and boys suddenly disappear on the eve of their eighteenth birthday’s in something called the Heist. Because of this, towns have slatings. This thought horrified me because slatings are essentially sending young men aged sixteen and older around Claysoot and getting them to try to sleep with whatever girl they are slated to that month so that they could have kids in a dying society. Essentially, if all things worked out, that means 12 kids per year to these young fathers. Thank heavens it was rare to conceive and this wasn't present day society. However, this practice was somewhat more tolerable to me once I found out through Gray that not everyone partook in it because there was such thing as waiting for love and not trying to have children young. Believe it or not, that way of thinking exhibited by Gray is somewhat rebellious in this novel. He’s impulsive and acts on instinct, much different than his older brother Blaine who follows the rules of Claysoot exactly. Named for his stormy eyes and black hair, it was easy to fall in love with this strong male protagonist because he had a big heart and would stop at no costs if he felt what he was doing was right. He is becoming a favorite of mine for his curiosity, strength, and unique humor. I like how his mind works. The cast of side characters are amazing as well. As much as I want to say more, I can’t reveal any of the truly important ones without ruining any of the amazing sub-plots in this one. And trust me when I say this, this book is absolutely filled to the brim with amazing sub-plots and plot twists. So, as the attention grabbing synopsis above states, Gray goes over the wall on an impulse relating to a certain hidden note he finds from his previously deceased mother. And this is where everything gets better. The secrets revealed in the next two thirds of the book were amazing and made this story incredibly enjoyable. I blew through it easily and excitedly. However, I must admit that despite the awesome science-fiction packed story that Bowman’s debut novel weaves, it was predictable. While I wish to say this novel was perfect, it wasn’t. There’s something lacking if you can guess the huge plot twists a mere third or so into the story like I did. Upon Grey’s arrival on the other side of the wall and the almost immediate revelation of what lays beyond it, I put a lot of things together hundreds of pages before Bowman allowed them to come to light. This ruined aspects of the novel for me because huge plot reveals weren’t that huge to me anymore. With that being said, I still found this novel enjoyable, just not as surprising as I believe it was originally intended to be. I also want to take a moment to touch upon the romantic aspects of this novel. It’s sort of an afterthought compared to the rest of the plot. While romance is somewhat existent, it’s not a main focus of the novel, and I must say I enjoyed that because the romance was set aside to allow us to enjoy a much more interesting overarching tale. If you’re looking for a romantic novel, this is not for you. If you want a totally kickass novel with some romantic sub-plots, I say check it out immediately! This book will be perfect for science fiction and dystopian lovers. The concept of the Heists and the explanations behind them will satisfy any science fiction junky’s appetite. It’s been a long time since I’ve read a sci-fi novel that I greatly enjoyed, so I urge anyone to pick this up if they have the chance. I love books that don't completely focus on the romance since I get annoyed when it becomes the main point. 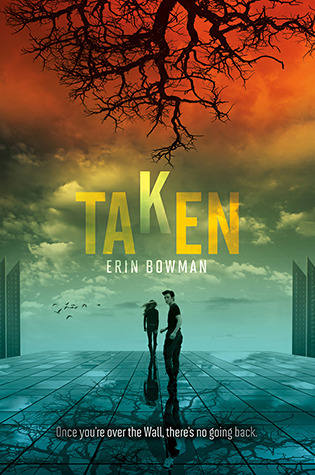 I've read mixed reviews about Taken but i'm glad that you enjoyed it. I'm glad that the romance isn't a main focus of the book and that there are other more important things, but I think hearing about this idea of the slatings is weird and disturbs me quite a bit. I do think I have to read this book to understand more about it. I'm glad you enjoyed this one. It does sound somewhat fun, but there seems to be too much to this book that doesn't interest me. I'm glad you enjoyed this one. I've seen so many on the negative side I was a bit worried that no one was going to like it. I've already decided I'm going to read it but I'm going to wait awhile before I do.